conducting a lot of public education about foie gras in Syracuse for 3 years now, particularly aimed at upscale French restaurant L’adour. 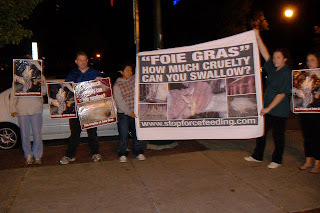 What: Hold signs and distribute literature to Valentine’s day diners. Signs and literature provided-just bring yourself and friends! Also, wear gloves and a hat- it feels cold being outside for an hour! Waverly Ave.) on SU Campus at 5:30pm sharp. This entry was posted in Uncategorized on February 14, 2012 by saro.